This bijous 1 bed apartment the heart of fashionable Chelsea had an awkward, unwelcoming layout. 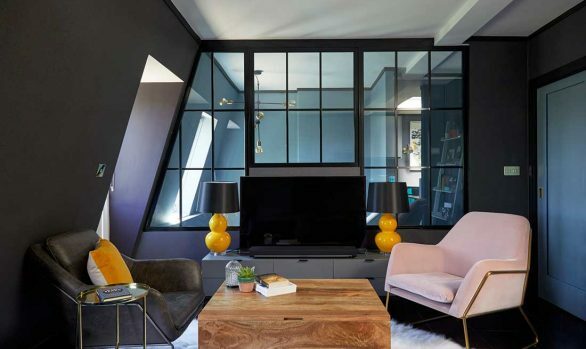 The client for this Chelsea Interior Design wanted it to feel less like a pied-a-terre and more like a permanent home, even though it would would be used sparingly, and requested a bright and elegant space that was more user friendly. The original entrance hall was unusually large for such a small flat, we immediately portioned off a section of it as a utility room, for a washing machine, dryer, linen store and ski/sports equipment area. 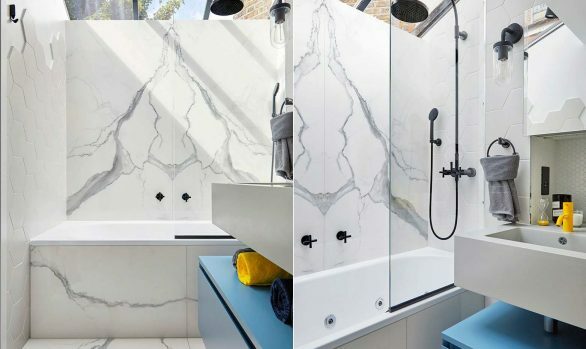 The bathroom, which had previously been a shower room and separate w/c, were combined and extra corridor space incorporated to create a larger, more practical space. Art deco references in the styling nod to the building’s origins. 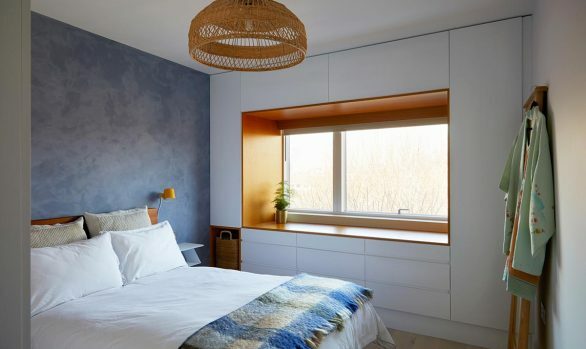 To avoid entering the flat and being faced with a sea of doors, the utility space was cleverly hidden behind a fully operational bookshelf, and the master bedroom door was disguised as a full length mirror. 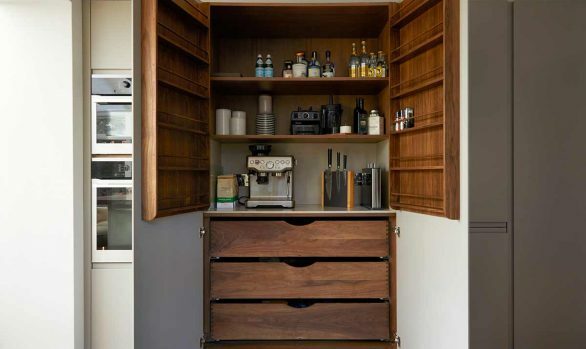 These tricks not only add a sly sense of whimsy and character, but also provide the client with added storage, functionality and 2 stunning features. The flooring, skirting and architraves were replaced throughout the property to give it a consistent flow. The warm, neutral colour palettes of greys and whites, combined with the dark wood tones and cold metal finishes keeps the interior fresh and bright, luxurious yet practical. The kitchen uses some old fashioned tricks of the trade to make it appear larger and brighter, whilst the very modern styling brings a contemporary twist to the rest of the apartment. 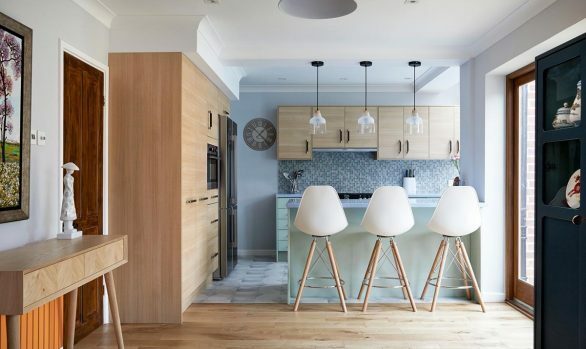 Specialised, considered, storage manages to keep the size down, whilst losing none of the required space or appeal, and the breakfast bar adds an bonus informal dining space to such a small flat. Kia Designs, with its ravishing interior design solutions, has established its presence in a large part of London. 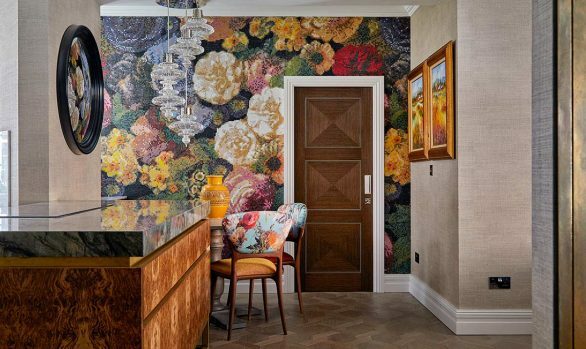 With time, we have a built a reputation as one of the most client-centric and committed interior design companies in the South West part of the city. Our Chelsea interior design services cater to this section of England’s capital. With our vast range of services, we have an answer to all of your design needs. 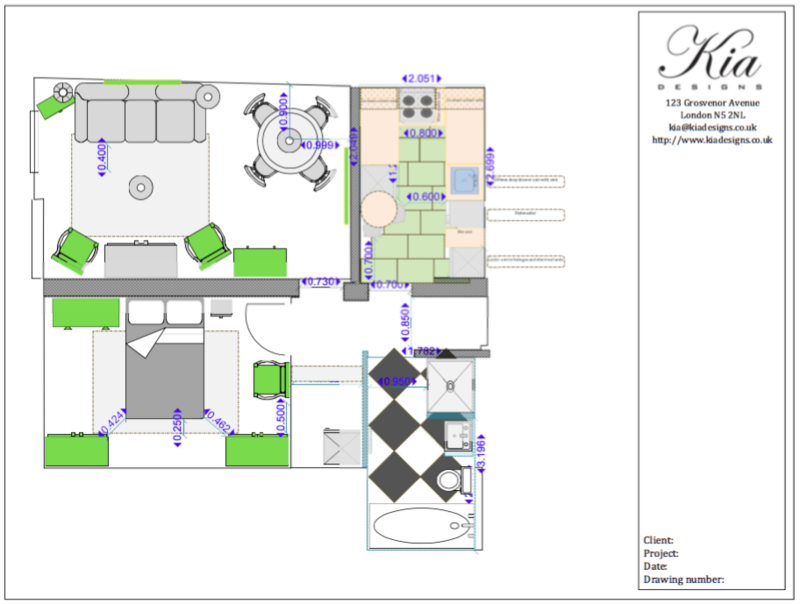 Whether you are a private client or a developer, our designs can work wonders for your construction. Whether you want simple decoration or an elaborate layout, we put in maximum efforts to replicate your thoughts. With our penchant for elegance and sophistication we make a great interior decoration partner. We have a tendency to identify the utility of a space and make optimum use of it. After our Chelsea interior design experts have worked on your property, you can easily notice the marked change in character and appearance. As your interior designers, we will try to bring about an overall change in the appearance of your interiors. We prove our expertise and skill with the much enticing shine and brilliance exuding from every angle of your house. With a well-run logistics team, we ensure end-to-end design services for all of our valued clients. Our all-encompassing services include negotiating with suppliers, arranging delivery and storage of items, coordinating with architects of your choice and more. Our goal of complete client satisfaction is meant for all of our clients, be they existing or new. When you have us as your designer, you can invest your precious time in other crucial aspects of home building or renovation.